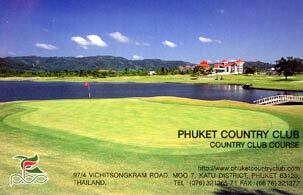 Phuket Country Club - 27-hole golf course is ideally located midway between Phuket Town and Patong Beach . The "Old Course" - a challenging 18-hole golf resort course and the "Country Club Course" - a 9-hole championship layout course part of a Recreation Centre and 52-bay Driving Range Facilities. "Old Course" provides a strenuous resort 18-hole 6483 yards par 72 golf game. Hole #10,557 yards par 5, is one of the most unusual hole you will find anywhere; a dog-leg right that snakes around an enormous lake and is reachable in one! To achieve it, you must aim 90 degree right of the fairway and be able to carry your drive 240 yards over the water. "Country Club Course" recreation centre with a 9-hole championship layout golf course, 3575 yards par 37, for low handicap golfers. The layout is not easy; every wayward shot penalized either landing in water or out-of-bounds. With five tee-off boxes at each hole, golfers have a choice of making it less of an ordeal. The distinct feature is water; water comes into play 90% of the time. The two clubhouses provide a panoramic view over the golf course with a 25-metre swimming pool banquet / conference room, locker rooms with sauna and golf clinic with American / Thai teaching professionals. The restaurant menu provides excellent Japanese, local Thai and Western food.